After considering the request, late last week the Andersons sent a detailed reply to the state agency. We have divided our 2.26 acres into 75 equal survey units with a draw tag for each unit. Application fees are only $8.00 per unit after you purchase the “Frog Survey License” ($120.00 resident / $180.00 Non-Resident). You will also need to obtain a “Frog Habitat” parking permit ($10.00 per vehicle). You will also need an “Invasive Species” stamp ($15.00 for the first vehicle and $5.00 for each add’l vehicle) You will also want to register at the Check Station to have your vehicle inspected for non-native plant life prior to entering our property. There is also a Day Use fee, $5.00 per vehicle. If you are successful in the Draw you will be notified two weeks in advance so you can make necessary plans and purchase your “Creek Habitat” stamp. ($18.00 Resident / $140.00 Non-Resident). Survey units open between 8am and 3pm but you cannot commence survey until 9am and must cease all survey activity by 1pm. Survey Gear can only include a net with a 2″ diameter made of 100% organic cotton netting with no longer than an 18″ handle, non-weighted and no deeper than 6′ from net frame to bottom of net. Handles can only be made of BPA-free plastics or wooden handles. After 1pm you can use a net with a 3″ diameter if you purchase the “Frog Net Endorsement” ($75.00 Resident / $250 Non-Resident). Any frogs captured that are released will need to be released with an approved release device back into the environment unharmed. As of June 1, we are offering draw tags for our “Premium Survey” units and application is again only $8.00 per application. However, all fees can be waives if you can verify “Native Indian Tribal rights and status. Please let us know if we can be of assistance to you. Otherwise, we decline access to our property but appreciate your inquiry. 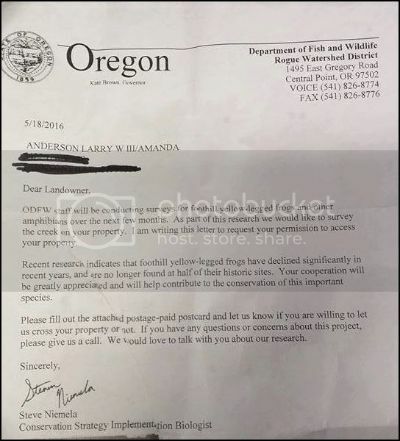 No word in the article as to whether or not the Oregon Department of Fish and Wildlife accepted these requirements.